GROHE, the world's leading manufacturer of sanitary fittings, first unveiled an immersive ATRIO installation for guests at the newly renovated GROHE Milan showroom (Via Crocefisso 19) in April during the Fuorisalone. The monumental black experience cube allows visitors to immerse themselves into a multimedia experience depicting an abstract story of the new ATRIO collection – a story of the two distinct characteristics of ATRIO: elegance and precision. 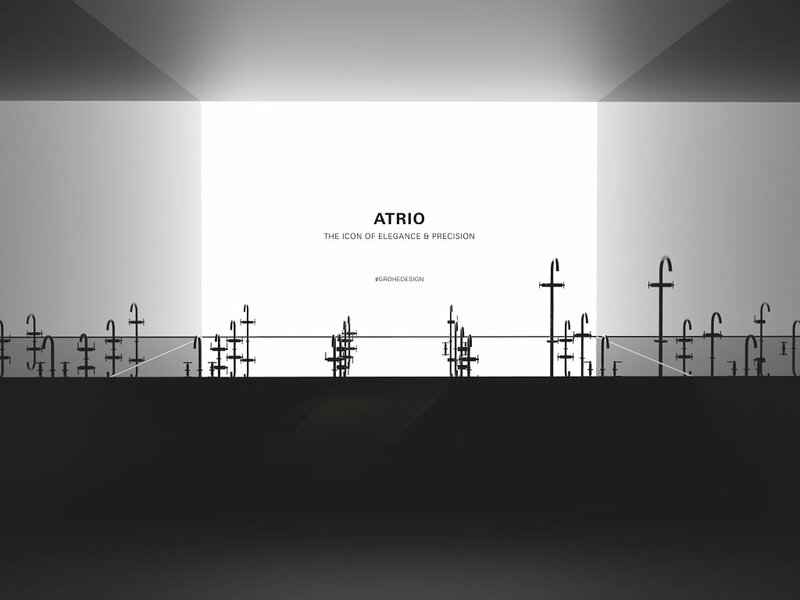 By standing in the middle of the cube, the spectators experience ATRIO with all their senses. The video sequences in combination with the music and a special water installation allow the guests to dive into the two defining attributes of the latest GROHE design highlight. “With the launch, GROHE welcomes a new era of design where we go beyond our well-known paths and create something truly meaningful – an icon. So ATRIO is a design more about what we didn’t do vs. what we did”, Michael Seum, GROHE’s Vice President Design, explains. The new ATRIO is a design where the typical temptations of strong luxury design elements were resisted. Its true elegance is formed by reduction and simplification, crafted solely from a singular geometry: a perfect circle which stands for efficiency, femininity and perfection. The cylindrical ring is further a highly symbolic form: a promise. The restraint of the design of the ATRIO collection ensures bringing, to any environment, a timeless elegance. In ATRIO, water precisely follows form. This engineering perfection made in Germany demanded a sense of craft balanced by technical expertise: “ATRIO‘s design restraint required technical experts to achieve new levels of engineering perfection. For this, design and engineering have to come together in precise harmony”, says Michael Seum. Furthermore, design permanence requires obsessive attention to detail and craft. Due to that, ATRIO is more than a faucet collection – it is the creative ideal of GROHE brought to life by German craftsmanship. The GROHE showroom is open to the public from the 17th until the 22nd of April between 10 am and 8 pm, except for Wednesday, the 18th of April, when the opening hours are 11 am to 2 pm.